I had some issues with the first edition of this classic book, which had some fantasy passages which were right up there with best of Terry Pratchett. But this edition does mark the graduation of this work to maturity and I can honestly say that it has become an essential reference work that everyone who plans, or even dreams to visit Scotland should have on their bookshelf. £14.99 gets you 450 closely-printed, indexed pages of information which is about as accurate as it is possible for a reference work like this to be. 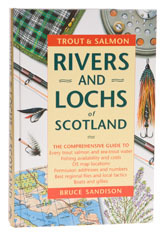 The country is split up into 85 different areas under which each location is described, broken down into access details, a commentary, some brief words about the type and quality of the fish, flies and tactics, and where to get permission. I take my hat off to Bruce. He is passionate about Scotland and the sporting opportunities it offers, and his enthusiasm shines out in this work. Maintaining it must be something like the Forth Bridge and anglers owe some kind of a debt to the author and publisher for making something as useful as this available. Morally, you ought to buy it. The edition reviewed is out of print, but I notice that it was reissued by Black and White Publishing in 2011. This edition is said to have been revised, but I have not had a chance to review a copy.